Greek Fire - The Byzantine Empire had a secret weapon that for centuries allowed them to keep their enemies at bay. It was called Greek Fire and its contents are unknown to this day. 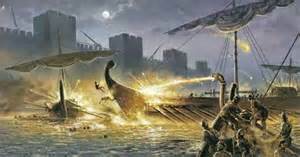 Those who witnessed it marveled at its ability to burn even on water, and as a result, the Byzantines armed their ships with it. Modern experts surmise that it may have been some form of medieval naphtha. Greek Fire played a particularly crucial role in protecting Constantinople from two sieges by the Umayyad Caliphate in the late 7th and early 8th centuries.